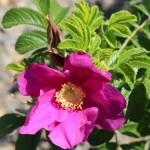 A large, coarse shrub with heavily veined, bright green leaves and large, fragrant, red-purple, flowers throughout the summer. The one inch fruit is orange and red in fall and winter. It is a good barrier plant, useful as a hedge, or for mass plantings. 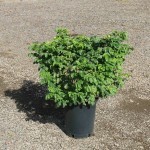 It is very tolerant of cold and heat, preferring full sun in a site with good air circulation. Water regularly in dry seasons. It should be pruned as needed in late winter to early spring.